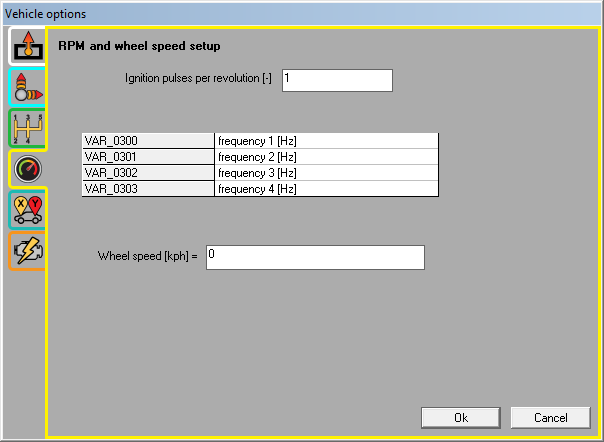 Inputting the correct number of pulse per engine revolution here allows the software to correctly scale your RPM input. Setting the RPM pickup parameters enables the software to translate the number of ignition pulses into the correct engine speed. To do this, you will need to know how many pulses per engine revolution the RPM pickup will record. This will vary depending on where the RPM pickup is situated. There are 2 standard variables for speed in the analysis software, �Speed� and �Wheel Speed�. Speed is used thoughout the software and used to calculate distance, and track maps. Wheel speed is from the vehicles wheels and typically only used in specialist applications. If there are any significant scaling differences, then please check the equation that was used to convert to a wheel speed.